As you all know, Gujarat has been under the grip of natural calamity. 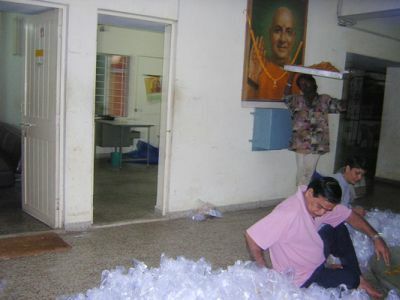 Surat, in particular has been struck with devastating flood tragedy since August 8, 2006. Lakhs of people have been stranded and become homeless. For days together there have been no electricity, food, drinking water or milk. We pray for the peace and well-being of the flood victims. Lord Vishwanath Temple at the Ashram is like a pilgrim place especially during the Holy month of Shravan. As always, hundreds of devotees offered special pooja, Rudrabhishek, Rudripath, Prathiveshwar Pooja, Prahar Pooja etc. 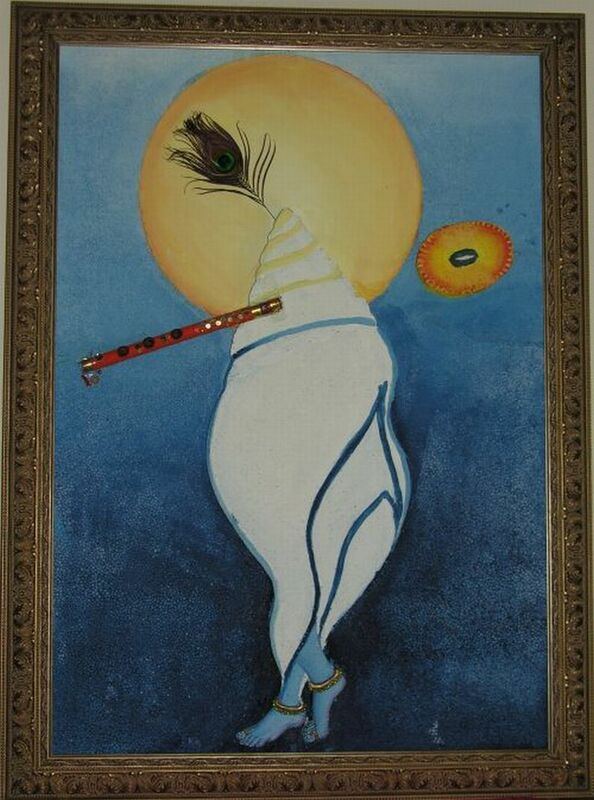 through out the holy month of Shravan. 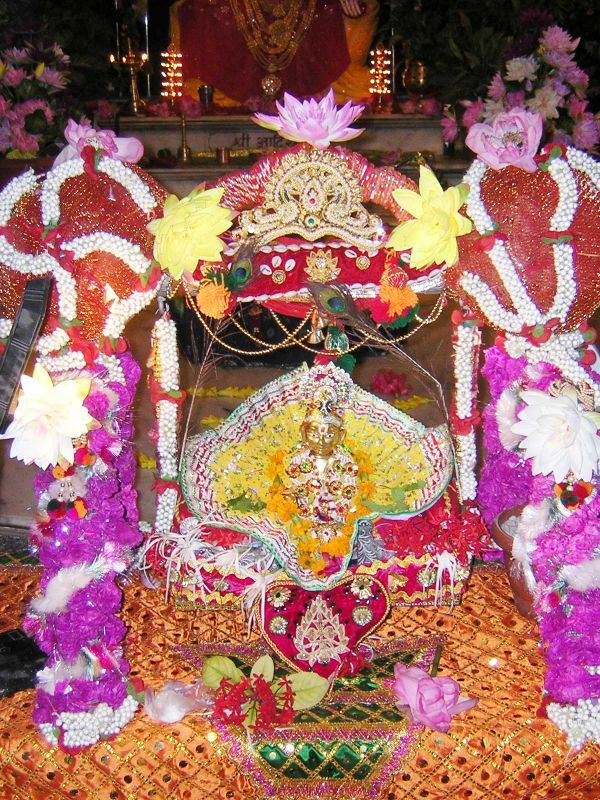 About 6 lakhs of sacred Bilva patras were offered to the Lord Vishwanath. 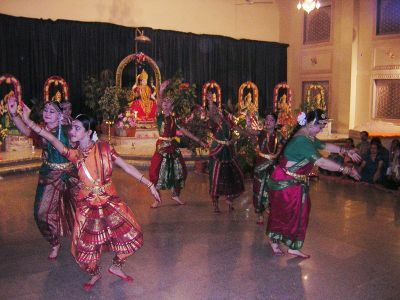 The last day of Shravani Amavasya was the culmination, Homatmak Laghurudra was performed. About one thousand devotees participated in sacrificial offerings accompanied with Rudra Mantras chanting and Mahaprasad. 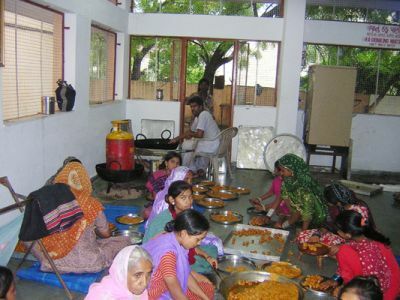 Independence Day was celebrated on August 15, 2006 at the Ashram. National Flag unfurled by a trustee and vice president Sri Arun Oza in the morning. Devotees in large number gathered at the Ashram to celebrate Janmashtami, a Birthday of Lord Krishna. 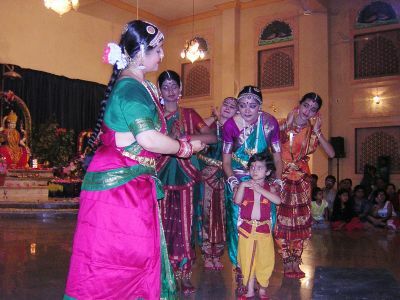 Devotees offered prayers, chanted & danced joyously in praise of the Baby Krishna. A beautiful Sri Krishna Bal-Lila, a dance performance in Bharatnatyam style, enacted by the artists of “Nrutya Sadhana”, which was directed by Smt. Archita Mehta. The celebration was concluded with Kirtan and Aarati at midnight. Video tape of H. H. Sri Swami Chidanandaji Maharaj's darshan and His Gurupurnima Message at Rishikesh was played on big video screen in the evening at this gathering. Devotees were very happy to have GuruMaharaj’s Darshan & Blessings. Rev. Sri Swamiji was given formal welcome with traditional reception at Mrs. Myra’s parent’s home. It happened to be Myra’s birthday also. There was a jubilant celebration arranged by the members of her family & well-wishers on this occasions. 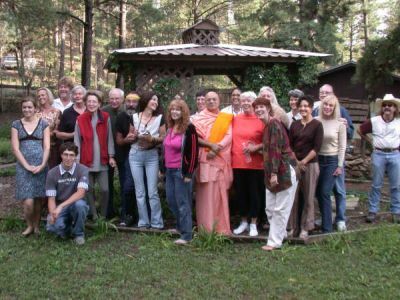 After prayers & dinner Swamiji’s spiritual discourse was organized at Yoga Studio at Ruidoso from 7.00 pm to 8.30 pm, which was attended by large crowd. "Swami shares peaceful Philosophy with Utahn ", interview by Jason Bergreen of "Salt Lake Tribune." Utahn enjoyed a short visit of Swami Adhyatmanandaji, which was organized by Smt. Resham Shah and Smt. Padama Shah, her mother who is visiting her from Ahmedabada. Dr. Surabh Shah & Smt. Padma Shah received Swamiji at Salt Lake City airport on Aug 4, 2006 at late evening. On Aug 5th to Aug 7th, 2006 morning Yogasana, Pranayam & Meditation sessions were held at Sri. Ganesh Temple of Hindu Society Utah. Sri Swamiji’s discourse on subjects of “Gita in Daily Life” and “Stress Managment through Yoga” attracted many people. On Mid-day of Aug 5th & 6th Swamiji’s discourses were organized at Yoga Studio as well as with a group of devotees of Neo Religion of Utah A special satsang and Sri. Satya Narayan Pooja was organized at Smt. Sudha and Dr.Shah’s home. Swamiji visited devotees home upon their requests also here. Swami Adhyatmanadaji 's interview was published in "Salt Lake Tribune" well read newspaper. Prior to Swamiji' s arrival interview of Smt. Padama shah about Swamiji’s Mission, Sivananda Ashram, Ahmedabad and work of Sri Swami Sivanandaji Maharaj was published in Salt Lake Tribune. Salt Lake Tribune interview. Respected Vinod Rana & Mrs. Kalpana Rana organized Sri Swamiji Adhyatmanandaji’s short visit to LA. Swamiji arrived here late afternoon of Monday, Aug 7th of Holy Shravan month. It is dedicated to worship of Lord Shiva. In the evening grand worship of Lord Shiva was organized at Sanatan Temple of Anaheim. Sri Swamiji enlightened a big crowd with his discourse “ Shiva Tatwa “ Next day after a short visit to Sri Swami Narayan temple (Kalupur group), at Sanatan Temple Swamiji gave discourse upon the "Secret of Bhagavat Gita." During His stay Swamiji visited well wisher’s home and conducted prayers and satsang also. On Aug, 8th morning Swamiji visited Sri. Morari Bapu’s katha at Anaheim. On Aug 9, 2006 morning Swamiji left for Indianapolis. Sri Dinesh Patel & Smt. Aruna Patel are devotees of H. H. Sri Chidanandaji Maharaj. 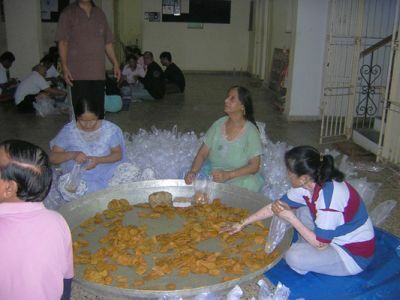 They are having same love and devotion for Sri. Swami Adhyatmanandaji Maharaj. Swamiji had flying visit to their home at Bloomington. Evening satsang on Aug 9th and Sri Satya Narayan Vrit – katha on Aug 10th on Rakshabandhan, Shravani Purnima day was organized at their home. Sri Swamiji left for Chicago on Aug 10th afternoon. 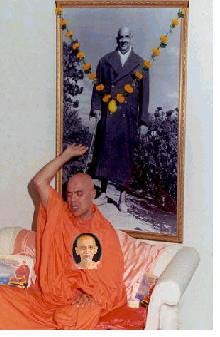 With the Grace & Blessings of Holy Master Sri Swami Sivanandaji Maharaj, " Divya Tour 2006" of Pujya Swami Adhyatmanandaji Maharaj is concluded on August 30, 2006. Pujya Swamiji’s holy presence and divine satsang has brought joy and solace to many spiritual aspirants & yoga lovers in the West. Morning Yoga sessions and evening satsangs were well received all across the USA and Canada. Devotees accorded him warm welcome wherever he went and loved him for teaching Yoga way of Life. Revered Sri Jogendra ji is a disciple of Sri Bapuji (Sri. Sri Sri Punitacharyaji Maharaj of Girnar Sadhana, Ashram Junagath) He attended Yoga teacher’s training course at Sivananda Ashram, Ahmedabad in December of 2005. Having inspired by Swami Adhyatmanandaji Yoga way of teaching he organized program of Swamiji Maharaj at London (UK). After spending two days at Sri Anupam mission in the holy company of Sri Sahebji Sri Swamiji arrived at Ahmedabad on Aug 31, 2006 morning at 10.00am. A warm reception and cordial welcome was given to Swamiji by large number of devotees at Sri Sardar vallabhabhai Patel International Airport at Ahmadabad.